Carlos Meriles was born and raised in Córdoba , Argentina . 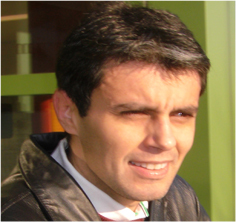 He obtained his Ph.D in physics at FaMAF – the mathematics, physics and astronomy division of the Universidad Nacional de Córdoba – under the supervision of Prof. A.H. Brunetti. His doctoral studies focused on the use of Nuclear Quadrupole Resonance (NQR) to probe structural and dynamical disorder in organic crystals. After graduating in 2000, he joined the group of Prof. Alexander Pines at the University of California , Berkeley to work on Nuclear Magnetic Resonance (NMR), his present field of research. In 2004, he joined the Department of Physics at City College where he now teaches as a Professor. Ph.D in Physics, Universidad Nacional de Cordoba, Argentina, 2000. The use of electron and nuclear spins to probe the structure and dynamics of diverse materials as well as to tackle problems of emerging technological importance is a field of research that today lies at the intersection between physics, chemistry and biology. Work at the Meriles group contributes to this broad area with focus on the characterization and control of nuclear spin dynamics in condensed matter systems. We are particularly interested in the use of optical methods to generate states of high nuclear magnetization as well as in the development and application of novel strategies for optical sensing and manipulation of nuclear spins. Our work emphasizes the use and development of new time-resolved schemes to monitor spin dynamics and novel tools to probe nuclear spins at the micro- and nanoscale. “Long-distance excitation of nitrogen-vacancy centers in diamond via propagating surface spin waves”, D. Kikuchi, K. Hayashi, A. Laraoui, N. Mizuochi, M. Hatano, E. Saitoh, Y. Kim, C.A. Meriles, T. An,submitted. “Room temperature, optically-driven tunnelling and back-tunnelling of defect-trapped electrons”, S. Dhomkar, P. Zangara, J. Henshaw, N.B. Manson, M.W. Doherty, A. Alkauskas, C.A. Meriles, submitted. “Nonvolatile quantum memory enables sensor unlimited nanoscale spectroscopy of finite quantum systems”, M. Pfender, N. Aslam, H. Sumiya, S. Onoda, P. Neumann, J. Isoya, C.A. Meriles, J. Wrachtrup,submitted. Available as arXiv: 1610.05675v1. “Spin dynamics of ZnSe-ZnTe nanostructures grown by migration-enhanced molecular beam epitaxy”, V. Deligiannakis, S. Dhomkar, H. Ji, D. Pagliero, I.L. Kuskovsky, C.A. Meriles, M.C. Tamargo, submitted. “Optical patterning of trapped charge in nitrogen-doped diamond”, H. Jayakumar, J. Henshaw, S. Dhomkar, D. Pagliero, A. Laraoui, N.B. Manson, R. Albu, M.W. Doherty, C.A.. Meriles, Nature Commun. 7,12660 (2016). Also available as arXiv:1609.03085. “Imaging thermal conductivity with nanoscale resolution using a scanning spin probe”, A. Laraoui, H. Aycock-Rizzo, X. Lu, Y. Gao, E. Riedo, C.A. Meriles, Nature Commun. 6, 8954 (2015). “Probing molecular dynamics at the nanoscale via an individual paramagnetic center”, T.M. Staudacher, N. Raatz, S. Pezzagna, J. Meijer, F. Reinhard, C.A. Meriles, J. Wrachtrup, Nature Commun. 6, 8527 (2015). “Imaging nuclear spins weakly coupled to a probe paramagnetic center”, D. Pagliero, A. Laraoui, C.A. Meriles, Phys. Rev. B 91, 205410 (2015). “Recursive polarization of nuclear spins in diamond at arbitrary magnetic fields”, D. Pagliero, A. Laraoui, J. Henshaw, C.A. Meriles, Appl. Phys. Lett. 105, 242402 (2014). "Generation of spin-polarized currents via cross-relaxation with dynamically pumped paramagnetic impurities", C.A. Meriles, M.W. Doherty, Appl. Phys. Lett., 105 , 022403 (2014). Available as arXiv:1407.7438. "Scalable Fabrication of High Purity Diamond Nanocrystals with Long-Spin-Coherence Nitrogen Vacancy Centers", M. E. Trusheim, L. Li, A. Laraoui, E.H. Chen, O. Gaathon, H. Bakhru, T. Schroeder, C.A. Meriles, D. Englund, Nano Letters 14, 32 (2014). ASAP article, published online 11/13, DOI: 10.1021/nl402799u. Highlighted by PhysicsWorld.com, IOP, Dec 2013. "Approach to dark spin cooling in a diamond nanocrystal", A. Laraoui, C.A. Meriles, ACS Nano 7, 3403 (2013). "Rapid prototyping of a liquid core waveguide in a microfluidic PDMS channel for optical sensing", F. Song, J.Xiao, D.Pagliero, C.A. Meriles, S-W Seo, Opt. Eng. 52, 04404 (2013). "High-Resolution Correlation Spectroscopy of 13C Spins Near a Nitrogen-Vacancy Center in Diamond", A. Laraoui, F. Dolde, C. Burk, F. Reinhard, J. Wrachtrup, C.A. Meriles, Nature Commun. 4, 1651 (2013). "Nuclear magnetic resonance spectroscopy on a (5nm)3 volume of liquid and solid samples", T. Staudacher, F. Shi, S. Pezzagna, J. Meijer, J. Du, C.A. Meriles, F. Reinhard, J. Wrachtrup, Science 339, 561 (2013). "Nitrogen-Vacancy-assisted magnetometry of paramagnetic centers in an individual diamond nanocrystal", A. Laraoui, J.S. Hodges, C.A. Meriles, Nano Letters 12, 3477 (2012). "Optically re-writable patterns of nuclear magnetization in Gallium Arsenide", J.P. King, Y. Li, C.A. Meriles, J.A. Reimer, Nature Communications 3, 918 (2012). "Resonant enhancement of polarization conversion in microdisk resonators", L. Deych, C.A. Meriles, V. Menon, Appl. Phys. Lett. 99, 241107 (2011). "Magneto-optical contrast in liquid-state optically-detected NMR spectroscopy", D. Pagliero, C.A. Meriles, Proc. Natl. Acad. Sci. USA 108, 19510 (2011). "The diamond Nitrogen-Vacancy center as a probe of random fluctuations in a nuclear spin ensemble", A. Laraoui, J.S. Hodges, C. Ryan, C.A. Meriles, Phys. Rev. B 84, 104301 (2011). Available as arXiv:1104.2546. "Helicity-independent OPNMR in Gallium Arsenide", Y. Li, J.P. King, L. Peng. M.C. Tamargo, J.A. Reimer, C.A. Meriles, Appl. Phys. Lett.98, 112101 (2011). "Approach to high-frequency, cavity-enhanced Faraday rotation in a fluid", D. Pagliero, Y. Li, S. Fisher, C.A. Meriles, Appl. Optics 50, 648 (2011). "Time-resolved optically-detected NMR of fluids at high-magnetic field", D. Pagliero, W. Dong, D. Sakellariou, C.A. Meriles, J. Chem. Phys. 133, 154505 (2010). "Characterization of random AC magnetic fields using a single Nitrogen-Vacancy center", A. Laraoui, J.S. Hodges, C.A. Meriles, Appl. Phys. Lett. 97, 143104 (2010). Available as arXiv:1009.0316. "Imaging mesoscopic nuclear spin noise with a diamond magnetometer", C.A. Meriles, J. Liang, G. Goldstein, P. Cappellaro, J. Hodges, J. Maze, M.D. Lukin, J. Chem. Phys. 133, 124105 (2010).Available as arXiv:1004.5426. "Dependence of electron spin relaxation times on the crystal orientation of CdTe grown on (100)ZnSe/GaAs substrates", Q. Zhang, Y. Li, X. Liu, D. Pagliero, A. Shen, C.A. Meriles, M.C. Tamargo, Phys. Stat. Sol. (c) 7, 1665 (2010). "Controlled growth of (001) or (111) CdTe epitaxial layers on (001) GaAs by molecular beam epitaxy and study of their electron spin relaxation times", Q. Zhang, Y. Li, D. Pagliero, W. Charles, A. Shen, C.A. Meriles, M.C. Tamargo, J. Vac. Sci. Technol. 28, C3D1 (2010). "Optical pumping of nuclear magnetization in GaAs/AlGaAs quantum wells of variable electron density", B. Li, P. Coles, J.A. Reimer, P. Dawson, C.A. Meriles, Sol. State Comm. 150, 450 (2010). "Helicity-independent optical pumping of nuclear magnetization in bulk CdTe", W. Dong, B. Li, Q. Zhang, M.C. Tamargo, C.A. Meriles, Phys. Rev. B 80, 045211 (2009). "Control of crystal orientation of CdTe epitaxial layers grown on (001) GaAs with ZnSe buffer layer by molecular beam epitaxy", Q. Zhang, W. Charles, B. Li, A. Shen, C.A. Meriles, M.C. Tamargo, J. Cryst. Growth, 311, 2603 (2009). "Detection of long-range dipole-dipole interactions between nuclear spins in distant solids", W. Dong, C.A. Meriles, Chem. Phys. Lett. 470, 313 (2009). "Ex-Situ magnetic resonance volume imaging", V. Demas, J. Franck, L. Bouchard, D. Sakellariou, C.A. Meriles, R.W. Martin, J.A. Reimer, A. Pines, Chem. Phys. Lett. 467, 398 (2009). "Optical detection of NMR in organic fluids", C.A. Meriles, Concepts Magn. Reson.Part A 32A, 79 (2009).